VERSITLE AND ACCURATE - Designed exclusively for animal research the Ranger Mate is a simple versatile tool that can be used in a variety of applications. Weights can be automatically recorded and transferred to a host computer. The polyethylene tube illustrated can be interchanged with a flat platform. The Ranger Mate takes its name from the Calan Data Ranger. The association is that the Ranger Mate is equipped with the same weighing data storage system as the Calan Data Ranger. 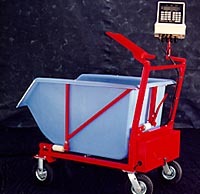 The Ranger Mate is a conventional-type feed cart consisting of a steel chassis and a polyethylene dump body. The chassis and body are mounted on a 4-wheel undercarriage for use on concrete floors. The body is capable of accommodating approximately 400lbs. of pelletted concentrate ration. It will hold 200-300lbs. of forage material, depending on density. The unit is completely manually operated as opposed to being mechanically driven. The unit is equipped with a scale system consisting of 3 weigh bars and a micro-processor based scale indicator specifically designed to meet the needs of animal research facilities. The scale system is powered by a 12 volt battery that is recharged with a built-in charging system which operates from a 120 volt power source. The Ranger Mate is equipped with a removable mini-desk, designed to accommodate a clipboard for miscellaneous notes and operator's instructions. We anticipate the Ranger Mate will serve as a versatile piece of equipment used to perform a variety of tasks in a research environment. We have listed below some common applications known to us. perhaps you could enlighten us as to additional applications we may not have considered. To dispense and weigh feed rations to a limited number of dairy or beef cattle housed in a laboratory setting. To dispense forage or grain/forage mixtures to small ruminant animals such as sheep or goats. To dispense grain rations to individual penned or group-penned pigs. To recover and weighback orts. In this instance, it is practical to use the Ranger mate for large numbers of beef or dairy cattle in that weighback quantities are generally small. To weigh litters of pigs, lambs or goat kids. Crop research work - weighing seed, fertilizer, grains or produce. Scale available in pounds or kilos in increments of .2 lbs or .1 kilo. Front or side loading capability. © 1997 American Calan. All Rights Reserved.